Home FEATURED NEWS Could German Car Museums Be Special Venues? The automotive sector is extremely important for Germans as it represents a way of life and a strong economic industry. The Germans are proud of their automotive brands and everything they represent in a worldwide sense. German cars also have a special place globally as they are a synonym of quality because they symbolise technological superiority, brilliant design, and engineering knowledge. That is why museums were built by “the big four” showcasing the entire history of the trademarks. The architecture and design tell a story of the brand and its philosophy and hence show why they are the best and most technologically advanced. The four trademarks are located in the South of Germany in the Bavarian and Baden-Wurttemberg regions. A large part of these trademarks is located in Stuttgart, which is referred to by some as the “German Detroit” and has 40 automotive and technology museums. All the Bavarian cities we visited in July have something in common. All over Bavaria they value tradition and also make sure that the cities are meticulously clean and ready for congress guests. The museums we visited are a great added value for organisers, as they offer spaces with exceptional concepts and architecture that impress event organisers. Carl Friedrich Benz is known as the founder of the modern car, and so a visit to the Mercedes Benz Museum in Stuttgart is a great start through the history of German automotive history, started in 1886. The museum beautifully illustrates the big picture of automotive history by travelling through the historical events have which shaped individual eras of Mercedes. The remarkable exhibits on display reflect the technical craftsmanship of the trademark and by the end of the visit, it becomes clear why Mercedes has such a profound reputation. The museum has been around since 1936 and was renovated in 1986 for the 100th anniversary of the invention of the car. Because the collection grew so quickly the museum was expanded and opened to the public in 2006. The museum’s design is in a spiral course and over a million visitors walk through its 8 floors every year. All 160 vehicles showcased are driveable. Most of the meeting spaces are located on the ground floor. A large event space is the open-air stage, adequate for concerts and new vehicle presentations. The largest hall is the Large Hall, a multifunctional hall with an impressive ceiling at 34 metres. The most prestigious space is the Casino on the 8th floor, offering incredible views of nearby vineyards. In the summertime, the outdoor terrace can be used as well. The Museum is located next to the Porsche factory in the Zuffenhausen district and was founded in 2009 as a monument to the most prestigious German automotive brand. The museum is an architectural achievement in its own right, as it appears to be levitating. The weight of the building (5000 tons), equal to that of the Eiffel Tower, is supported by just three pillars. The building was designed by the Delugan Meissl Bureau based in Vienna and the interior by the architectural bureau HG Merz. A workshop is also in the museum, where you can observe racing cars being repaired. On the exhibition floor, you can compare all the legendary vehicles in chronological order. The museum also offers an overview of the evolution of automotive technologies, design solutions and motorsport in general. There are 80 vehicles showcased in the museum, many of them part of motorsport history. The legendary 356 from 1946, which paved the way for the brand and the fascination with the 911 model common to all petrol-heads. The entire 4th floor is dedicated to events. It is adequate for the organisation of receptions and banquets. An essential part is the roof terrace, stretching over 800m2 and being one of the most special venues in Stuttgart. For visitors, the exhibition closes at 18:00, while for event participants it is open even later by arrangement. In the Audi-Museum-Mobile in Ingolstadt visitors go on an interactive journey to get to know the history and future of the Audi brand. From the beginning in 1903 Horch was known as one of the most prestige brands and even now, the vehicles from that time don’t fail to impress. The most important car models and motorcycles from the last 100 years majestically float on the lift throughout all 4 exhibition spaces. The museum was officially opened in 2000 and is also the centre of the Audi Forum, behind which the enormous factories of Audi are hidden. No fewer than 50 vehicles and 30 motorcycles and a number of other exponents are exhibited from the rich history of Audi, DKW, Horch, Wanderer, and NSU, which together form the four circles of Audi. The entire history of the legendary Audi Quattro, which most shaped the new development stage of the brand, is also on display. Congress halls inside the complex reflect the spirit and slogan of the trademark “Innovation through technology”. There are several locations available inside the forum and events can be rounded off with a factory or museum tour or even a test drive. The most attractive space is undoubtedly the museum where there is 300m2 of event space and the square in front of the museum and forum, especially attractive during summer. BMW has had its headquarters and manufacturing in the northern part of Munich since 1918. 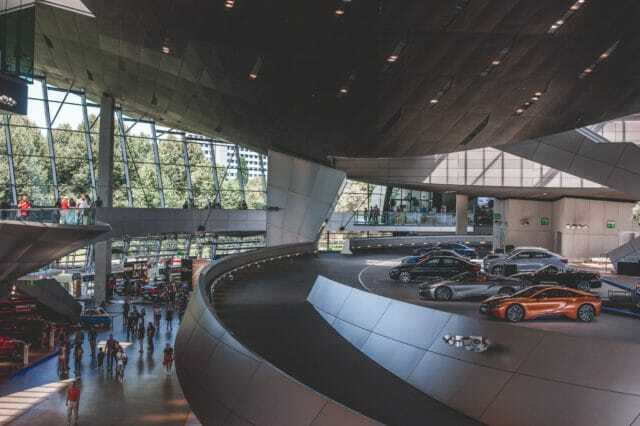 The award-winning architecture of the BMW museum in Munich is elegant and prestigious, as it should be for such a legendary automotive trademark. The minimalistic glass boxes take you through different thematic segments of the Bavarian brand that is tightly connected with Munich. It is one of the most visited German museums with tourists from around the world. The museum was upgraded in 2007 by gaining the BMW Welt complex. BMW Welt is a multifunctional building, that is a sort of a hybrid between a car showroom and an info centre. It is also the link between the company, trademark, products and its visitors. BMW Welt also has a hall for receptions called the Event Forum, equipped with the latest technologies in order to host all kinds of events. Besides hosting concerts, exhibitions, conferences and live broadcasting show, seminars and receptions take place as well. For meeting planners three halls are available. The BMW Platz impresses with its space height and the innovative LED performance. At the BMW Museumsschüssel, the 360-degree projection forms the unusual setting for your event. The BMW Museumsfoyer fascinates with its views of the museum architecture and the exhibition. 1. Ferdinand Porsche, the father of Porsche, made the first ever hybrid electric vehicle in 1899, known as the Lohner-Porsche “Semper Vivus”. 2. Mercedes-Benz got the first part of its name from Mercedes Jelinek, the daughter of Emil Jelinek, a driver for DMG. 3. The first Volkswagen Beetle was designed in a villa, where Ferdinand Porsche lived. 4. Porsche was once a tractor manufacturer and has an even more interesting history than Lamborghini in this area. 5. That BMW Welt is the most visited tourist attraction in Bavaria?